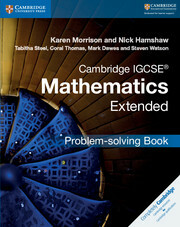 The Cambridge IGCSE® Mathematics Extended Problem-solving Book delivers a range of problems with fully worked solutions that develop students' mathematical thought. 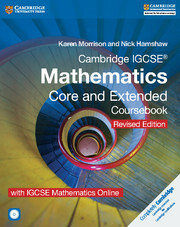 The resource gives students the opportunity to practise the range of mathematics skills covered in the Cambridge IGCSE Mathematics (0580) syllabus. The questions in the book encourage students to think widely about how to apply their knowledge to a broad range of tasks and problems. These help develop mathematical logic and key skills, such as reasoning, interpreting, estimating and communicating mathematically. Promotes a deeper understanding of problem-solving strategies in mathematics to help students apply their mathematical skills to unseen scenarios. Provides a different set of problems to those in traditional coursebooks — original questions encourage students to think widely and employ a range of skills. 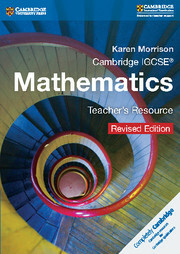 Can be used as additional material alongside the coursebook to develop approaches to problem-solving. Questions have star ratings to show the skill level involved and allow students to track their progress.